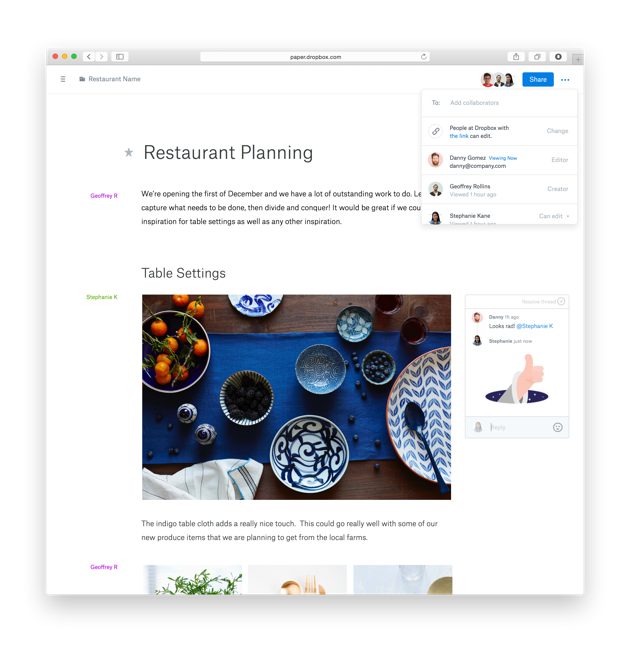 Six months ago, Dropbox quietly announced a collaborative note-taking tool called Notes and launched it in an invite-only beta test. 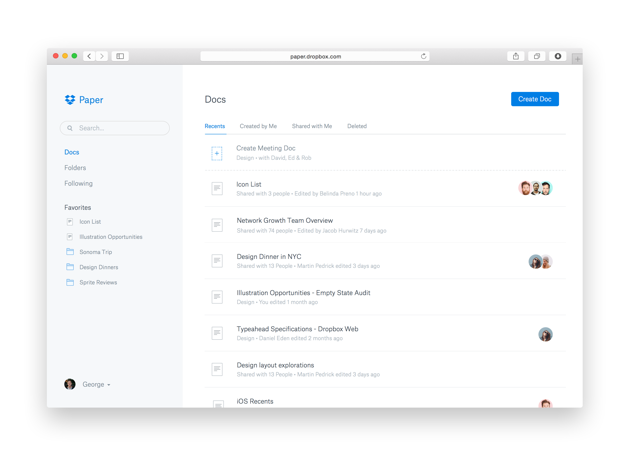 But starting today, the product is being officially branded as Dropbox Paper and the beta test is expanding significantly. You'll still need an invite, but the company gave us a preview of what's probably the biggest addition to Dropbox in years. It's far too early to tell if Paper will be able to keep up with entrenched tools from Google, Microsoft and many others -- but there are definitely some interesting features here that make it worth keeping an eye on. For now, Paper is a web-only app that you can access through your Dropbox account, although the company says it'll have a mobile app ready to go when the product comes out of beta. At first glance, Paper's UI is reminiscent of the scores of minimalist, lightweight text-editing apps that have come out in the past few years, such as IA Writer. But while IA Writer and its ilk are designed for solo composition, Paper is all about working together. As in Google Docs, multiple users can edit a document at the same time. Each is designated by a colored cursor, and the user's full name is displayed in the margins, crediting their contributions to the file. From a text perspective, Paper is quite basic; there's only one font and three sizes available. You can do your basic bold, italics, underline and strikethrough formatting and format text into a block quote, but that's about it. Dropbox specifically said that the purpose of Paper was to keep the focus on sharing ideas rather than formatting. In particular, the company made it so that you can use its app to share pretty much anything, regardless of what tools you might be using. "Work today is really fragmented," said product manager Matteus Pan. "It happens across multiple content types -- be it images, code, tables, even tasks." And that clutter extends to the tools being used. "I might be working on PowerPoint," he added. "Someone else may be writing code, another in Google Docs -- teams have really wanted a single surface to bring all of those ideas into a single place." At first glance, Paper does a pretty good job of bringing a bunch of different content and tools together. Project managers can add to-do lists, complete with checkboxes and "@" mentions to the member of your team who needs to take care of the associated task. If coding is more your game, you can start typing lines of code right into Paper and it'll automatically format it appropriately. Beyond text, any file you store in your Dropbox can quickly be added to Paper -- if you grab the sharing URL of the file and paste it into Paper, the program automatically formats a preview for you. That way, you can peek at an Excel or PowerPoint file right in line with the rest of your Paper document, or click to see it in full or save to your Dropbox. Google Docs files are even supported here -- it's the first time Dropbox has really integrated with Docs and Drive, itself a competitor to Dropbox's main business. Paper can display just about any kind of file you throw at it. Single photos can be dragged and dropped right into Paper, and you can create some mini-galleries, with two or three smaller images lined up. Everything is draggable, so you can reorder things quickly; you can also left or right align images and type text around them. For extra drama, you can blow an image up to a full-bleed, widescreen photo that takes up the entire browser window. If you need to add some multimedia, just dropping a YouTube link into the document will convert it to the full video player, and you can embed audio files and playlists from Spotify or SoundCloud as well. 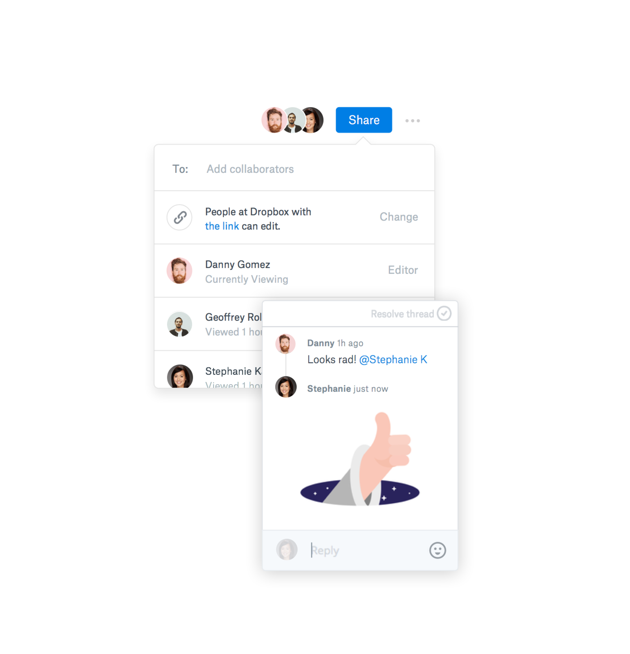 Naturally, you can comment on everything added to a Paper document, and Dropbox even jumped on the stickers bandwagon -- so if a giant skeleton thumbs-up is the only way you can properly express your approval, you're covered here. There are a few ways to keep track of the various documents you create in Paper. There's a quick shortcut to save items that you want to access easily into a favorites sidebar, and when you create a new document, you'll be prompted to put it in a folder. Since Paper is primarily a collaboration tool, new folders (and their contents) will be shared with your work team by default, though you can also create private ones for files that you want to keep to yourself. There's a pretty robust search feature that lets you both peer into the content of your documents and search names to find all the items that a particular person in your organization shared with you. Lastly, there's a "following" feed that lets you see chronological activity on files you own and are shared on. 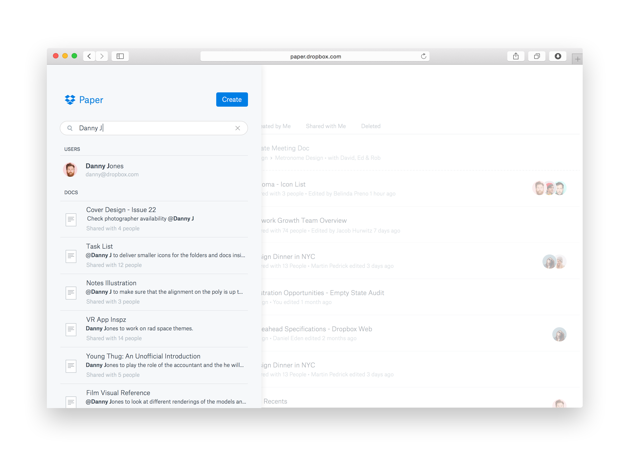 There's no doubt that Paper is one of the more fully realized and useful new products Dropbox has introduced in a while, particularly since Mailbox and Carousel have received few updates over the past year or so. But Paper is also entering a field crowded with big names like Google and Microsoft (and Dropbox has even spent lots of time partnering with the latter company as of late). When asked what differentiated it from the rest of the field, Pan pointed to Paper's focus on building documents that let users work and share multiple content types regardless of what's used to create them. He cited Paper as a way to collaborate that keeps things from getting overly "messy" in terms of both clean design and organization. The last differentiator is organization and helping teams find their work quicker. "Creation and collaboration are only half the problem," he said. "The other half is how information is organized and retrieved across an entire company." Simply having a good product philosophy doesn't mean people will adopt it, which is why Dropbox is being slow and deliberate with Paper's rollout. The team has been gathering feedback from its customers for months and intends to keep doing so as the beta expands. Indeed, Dropbox's focus on its business customers gives it a large base of people to test the product with and get feedback. And organizations that are already paying for Dropbox may be more likely to give Paper a try, either in beta or when the product is fully finished. Dropbox's next big product, or another project that falls by the wayside? The timing of that launch is still up in the air -- right now the focus is on getting Paper from "thousands of users to thousands of businesses and teams," Pan said. With all that feedback, Paper will likely continue to change before its official release, but the lack of a concrete timeline has to be at least somewhat concerning when you look at what has happened with some other major Dropbox initiatives -- the Mailbox for Mac app was introduced with fanfare over a year and a half ago, and it still remains in beta. But Paper plays a lot more to the company's strengths than anything it has introduced in a while. Collaboration, sharing and organization are all things the company has worked hard at with its core product for a long time. In that regard, Paper seems like a natural outgrowth of what it has done so far. Dropbox used to be all about organizing files -- but the move to mobile and the increasing power of web apps means that traditional file icons in Windows Explorer or the Mac Finder are less relevant than they used to be. Instead of organizing your company's data in files stored in your Dropbox, the company just wants you to do it all in Paper instead.